After a morning of teaching undergraduates about Grey’s “Elegy”, I was looking forward to a nice lunch with B at Koyama, on Forrest Road. I arrived and sat in the lovely, almost empty restaurant in the exact same booth I had sat in the first time I visited the building’s previous incarnation: Monster Mash. I had looked at the menu the previous evening, and had already decided what I wanted to eat for lunch. But turns out, I was wrong. I thought I wanted a sashimi salad, and a tuna roll…seems that instead, I wanted the sashimi salad and a bowl of noodle soup with a taste of a tuna roll. One thing I will mention here is that the menu on the web does tell me which rolls and things have mayo on them…a huge help since I hate the stuff, but the menu in store didn’t have the handy little ‘M’. Though, the menu in store did have number photos so I could tell what was what in the photos-which can be disconcerting, but in this case, the well made images were appetizing. After B arrived we faffed about and then ordered a sashimi salad to share. This came out with one piece of each type of fish. The white fish (of some sort) was really soft and delicious while the large section of crab claw had that certain crab-texture and sweet taste that I love. The light ginger-ish dressing was not overpowering and complemented the raw fish and greens nicely. The only complaint I have about this dish is that it was very small, whereas the same salad over at Yes Sushi is large enough to be a meal unto itself, for about the same price. Once we had almost destroyed the starter, a small tuna maki arrived. 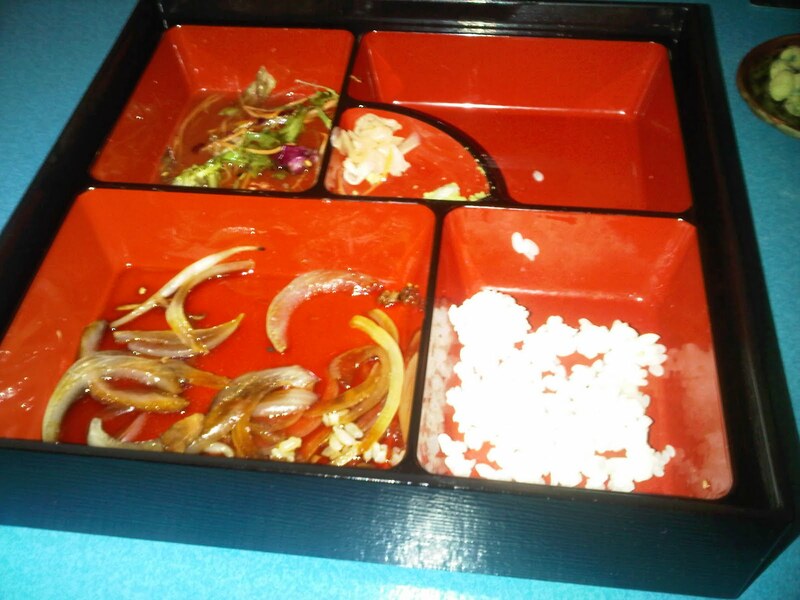 I ordered it because at a Japanese restaurant, one should order sushi. It was good, as freshly made sushi should be made, the rice was still very slightly warm, not packed overly tightly, and the tuna was silky and very fresh. 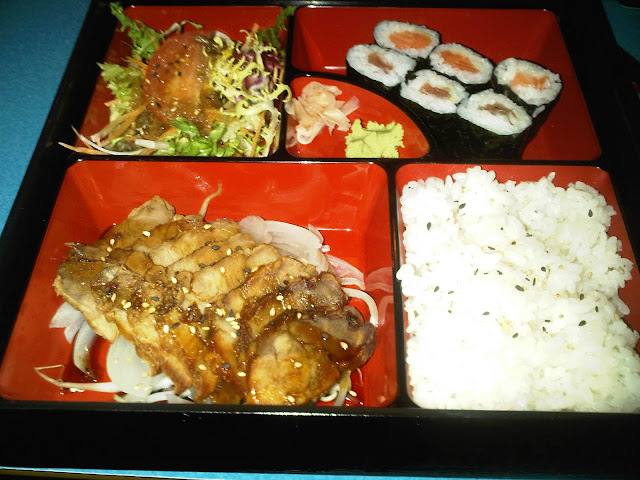 A very good example of Edinburgh’s sushi, and, I dare say, maybe the best I’ve had in the city. (And I’ve eaten sushi at almost every establishment in Edinburgh at this point-only need to visit Tang’s and Bonsai to round out my list). A few minutes later B’s bento box arrived. It came in a large black box which the waitress opened with flair. It looked beautiful and delicious, and I almost had food envy until my bowl of vegetable udon noodle soup arrived. Now, if the bowl of soup from Yocoko was a mouse’s Olympic swimming pool; this one was its smaller training pool. But that is by no means a bad thing. I didn’t feel overwhelmed by the sheer size of the dish, so I was able to tuck right in. The soup itself had the slight flavour of terriyaki, which wasn’t expected, but it added to the experience by making my soup different from other noodle soups I’ve had. The veggies were lovely. HUGE, and lovely with a variety that suited the soup base more than the standard bok choi and mushroom which have a tendency to go rubbery. The variety and size of the carrots, peppers, broccoli, bean sprouts, and aubergine, and a few others, was a welcome change. And the noodles themselves were thick and tasty, of their own accord. Not like the plain rice noodles that have little to no flavour at all, these I could have happily had on a plate with just a touch of evoo. (though that much of a mixing of cuisines seems a bit wrong). I had a taste of B’s pork and it was good, if a bit dry. Overall. I really like this place. I will go back. It is right near the university, but not overrun by students. The menu is eclectic and everything I tried was well made and tasty. The simply decor and the atmospheric music playing at a low enough level not to harass, was an added bonus. And at the end, they gave up mints and opened the door for us. Go here. It’s cheap, cheery, and quite good. We’d been looking for a Japanese quest for a little while, so I was delighted when my chum Eilidh passed on a recommendation for this place after a very enjoyable meal she had there, a few weeks back. Katey from Edinburgh Eats, one of our fellow Total Food Geeks, had also paid it a visit (read her review here), a couple of months ago. Armed with useful tips from both, we ventured forth to Forrest Road to sample its delights for ourselves. I am something of a novice when it comes to Japanese cuisine. When I have encountered sushi in the past I have enjoyed it, but not so much that I would regularly seek it out. There was great sushi at the wedding of our Lunch Quest: Istanbul bureau chiefs, for example, but it paled in comparison with the other treats (the memory of soft-shell crab lingers long) served on that particular Maldivian beach. I digress. While MJ has a panoply of sushi memories to draw upon for comparison, I do not. I arrived hopeful that Koyama might finally fire my enthusiasm for raw fish, sticky rice, and seaweed. The place, previously Monster Mash (although my memory still drifts to Café Sardi), is simply turned-out, with a mix of booths and tables. My wonderfully prompt and charmingly smiley fellow diner awaited me in one of the booths. 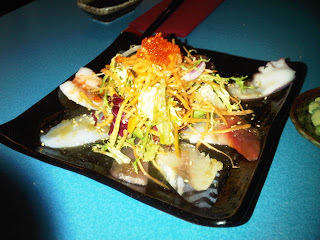 From the extensive menu, which both of us had perused online, we settled upon a sashimi salad to start, which we shared. I chose the maki bento, to follow, while MJ opted to further her exploration of “where the gentleman mouse is bathing this season” by ordering some soupy noodles, which I would just have played with for an hour then spilt down my tie. While we waited for the salad to arrive, we honed our chopstick skills by picking up individual wasabi peas from the small bowl that sat invitingly in the middle of the table. This proved good training for coping with our very pretty salad, which promptly arrived. Eight pieces of seafood were carefully arranged around a shredded salad topped with crab eggs. After settling who chose first with a short game of “chopstick attack”, we dived in. I surfaced with some tasty mackerel, a firm white fish, a juicy prawn, and a meltingly gorgeous morsel of tuna. The simply dressed salad provided suitable crunch and freshness. It was a tidy little dish and it made me happy. Hot on the heels of the salad came MJ’s tuna maki, my miso soup, then the wonderfully theatrical bento box, containing three tuna and three salmon maki, cashou pork, salad and rice. MJ’s soupy noodles arrived containing some of hugest sliced vegetables I’ve ever witnessed. One slice of carrot would have served a mouse very nicely as a surfboard. The miso was lovely, and neatly satisfied my ever-growing soup fetish. My pork had a curiously pleasing dryness to it, which melted in to a richly flavoured mouthful upon chewing. The rice was a glowing beacon of whiteness, seasoned with well-judged subtlety. The maki were right on the money, enhanced by some suitably sulphurous wasabi. The attentive and super-sweet waitress had some comedy capers with the card machine, when it came time to pay, but that only added to the joy of the occasion. Overall, Koyama presents you with a broad array of good quality Japanese dishes, well executed, neatly presented, and full of flavour. It’s positioned somewhere in the middle of the price range, but offers pretty good value in terms of what you get for your money. I’d very happily go back there and would recommend that you go and try it for yourself, too. We wore: What I consider to be our classic questing outfits: pinstripes with accompanying shirt stripes; purple and dark blue hoopy top with pony pendant. We ate: Sashimi salad, maki bento, vegetable udon noodle soup, tuna maki.